A great size for all your essentials, plus a little more, you can rest this design on your shoulder and be on your way. - One internal key chain. - One front slip pocket. - Radley London coin dog. - One internal slip pocket. 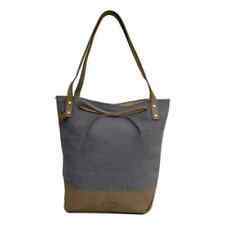 New Radley Shopper Tote Cotton Canvas Bag . Dispatched with Royal Mail 1st Class. A great size for fitting in all your essentials, plus a little more, you can rest this design on your shoulder and be on your way. - Front slip pocket. - Internal slip pocket. - Water-resistant material. Upper: woven fabric and leather- as new condition. Approx W 13" x 9" x 3.5", Handle drop 5". GENUINE RADLEY LONDON. BLACK BACKGROUND WITH RADLEY DOGS PRINT. Black Background Overprinted with the Much Loved RADLEY Dogs In Various Styles - Polka Dots / "Scribbled" / Lines - Stone Colour with Coral Colour Outline Detailing. Radley Portland Place Black Leather Tote Bag. 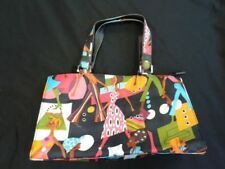 Condition is Used / Excellent Beautiful handbag, one of my favourites, though I have to sell as I need the money for a holiday. I have multiple items for sale please see others under my name if interested. Tote handbag, in black leather, excellent condition! Radley Fabric Tote Bag. internal zipped pocket. Condition is New in original wrapping see pictures. Dispatched with Royal Mail 2nd class and signed for. From a pet & smoke free home. Radley Logo Light Weight PVC Coated Fabric Paisley Cross-Body Shoulder Bag Handbag. Pretty tote handbag with two faux leather middle handles and faux leather detachable/strap. Zip-up fastening with faux leather zip Pull. Inside the bag there is a side zip-up pocket. On the other side are two other compartments/mobile phone holder. Faux leather Radley Scotty dog logo patch. Made from PVC which makes the bag waterproof. In immaculate condition with no stains or rips or tears. Measurements – Height 8 inches, Width 13 inches, Depth 4.5 inches. Please see all photos to show every detail of the bag. Thanks for looking. 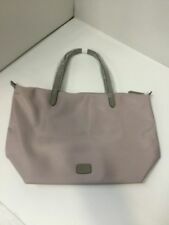 Small radley handbag in pale grey leather and fabric. with contrasting pink stripe canvas handles. NWT.Radley ‘Longleat Palms’ Green Fabric large tote shoulder bag. l nner Zip pocket. This is a unique style of RADLEY bag. Leather trim on the piping and on the top front with RADLEY embossed on it. There is a pale blue RADLEY dangling dog. There is a 20 1/2" leather strap with an inlay of the main bags fabric. 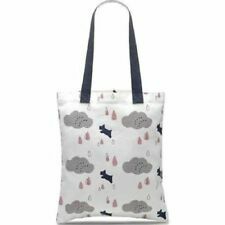 RADLEY TOTE BAG - APPROX 47 CMS MAX WIDTH x 26 cms tall (47 cms including handles). TWO HANDLES LARGE HANDLES THAT CAN BE USED TO CARRY ON SHOULDER. TAN LEATHER FINISHING. Radley Autumn Rose Shoulder Bag - Navy, Brand New. Floral and feminine, the Autumn Rose Fab shoulder bag from Radley is a casual yet playful addition to your weekend look. Handbag Type: Shoulder. GENUINE RADLEY LONDON. NAVY BLUE BACKGROUND WITH RADLEY DOGS & LARGE POLKA DOT PRINT. Navy Blue Background with Print of Much Loved RADLEY Dogs in Red and Large Light Grey Polka Dots. Grey Press Stud Fastening with RADLEY Dog in White. GENUINE RADLEY LONDON. NATURAL ECRU COLOUR CANVAS WITH RADLEY DOGS & POLKA DOTS PRINT. Interior has a Zipped Pocket for Security with RADLEY LONDON Printed. RADLEY LONDON Printed in Peach Colour on Each Side of the Bag. GENUINE RADLEY LONDON. PINK BACKGROUND WITH RADLEY DOGS & LARGE POLKA DOT PRINT. Rose Pink Colour Background with Print of Much Loved RADLEY Dogs in Grey and Large Cream Polka Dots. Grey Press Stud Fastening with RADLEY Dog in White. 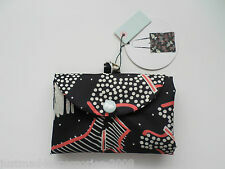 RADLEY BLACK NYLON FABRIC SMALL HAND BAG USED TWICE! RADLEY black nylon small bag. I used this bag only twice, so as new condition. I received it as a present like this. There is a dangling pink RADLEY leather dog. Fabric bag with a striped webbing strap and a leather base to the bag. There is an open topped pocket on the back with a magnetic snap fastening. Pink fabric lining. APPROX 13.5" WIDTH 16" LENGTH. Product Line Greyfriars Gardens. Radley London presents a go-to tote bag in sturdy leather outfitted. Style Tote. A hidden leather tab behind the shoulder strap allows you to affix your own. 1 back slip pocket, feet and tab behind front shoulder strap. 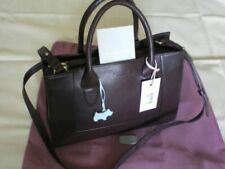 100% Authentic RADLEY LONDON SHINE Large Tote Bag. SHINE PRINTED ON FRONT. 1 ZIP POCKET. MADE OF BLACK COTTON EXTERIOR. TOP ZIP CLOSURE. BLACK INTERIOR LINING. COLOR: BLACK. GREAT DEAL. 100% Authentic RADLEY LONDON " SPARKLE " Burgundy Canvas Tote Bag. MADE OF BURGUNDY CANVAS EXTERIOR. BURGUNDY CANVAS INTERIOR. COLOR: Burgundy. 1 ZIP POCKET. We are not responsible for any extra fees they set. RADLEY LONDON Shine Large Tote Bag. SHINE PRINTED ON FRONT. 1 ZIP POCKET. MADE OF BLACK COTTON EXTERIOR. TOP ZIP CLOSURE. BLACK INTERIOR LINING. We are not responsible for any extra fees they set.